What do you give a kid for Christmas who loves books? A book, of course! Or several books, even. When I was a kid, we always received a book for Christmas, and for our birthday, regardless of what else we got. But if you are looking to give something a bit more than a book – or as well as a book? – I’ve rounded up some great ideas for you. Some of these are free samples, that have been provided to us for review, but unlike the bigger brands I have been working with over the past few weeks, these are all from independent sellers, so it’s a great opportunity for me to support some small businesses too! Imagine you are a kid, and you get given your favourite character from your favourite book as a cuddly toy! The likes of Winnie-the-Pooh, Paddington Bear or Peter Rabbit, have been around as cuddly varieties for years, but nowadays there is a whole host of children’s book characters available to cuddle and cherish. 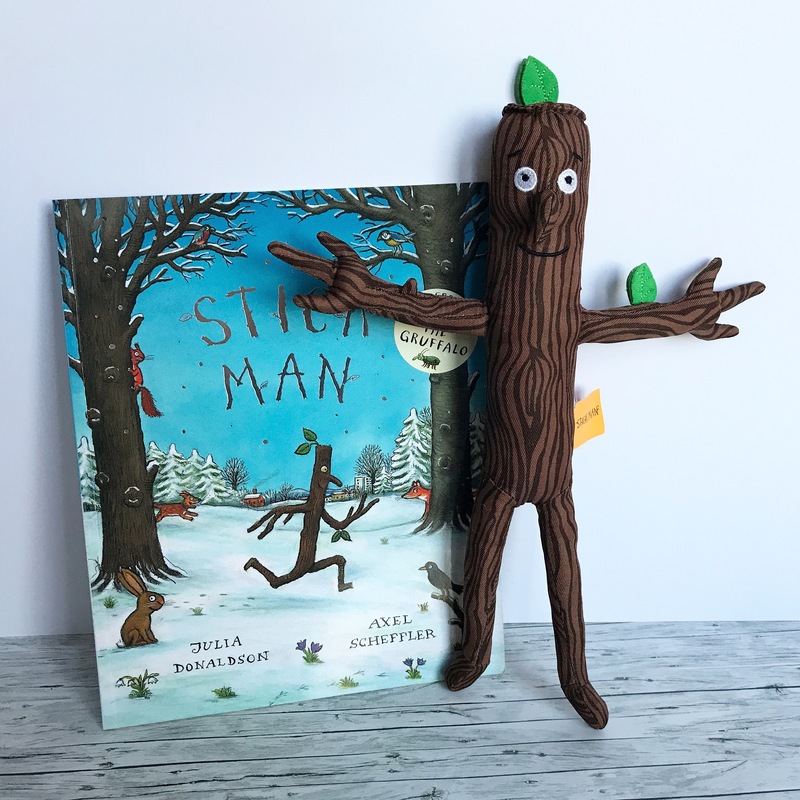 Amanda, from Books & Pieces sells a few book + cuddly toy sets in her web shop, and has kindly sent us a free Stick Man set for inclusion in the gift guide. Mr Fox is absolutely obsessed with sticks at the moment – which little boy isn’t? – and even has a favourite stick he takes with him to nursery every day. He was absolutely ecstatic to receive his very own Stick Man, and has taken him to bed with him every night since. Why not check out the other book + toy sets on Amanda’s site! 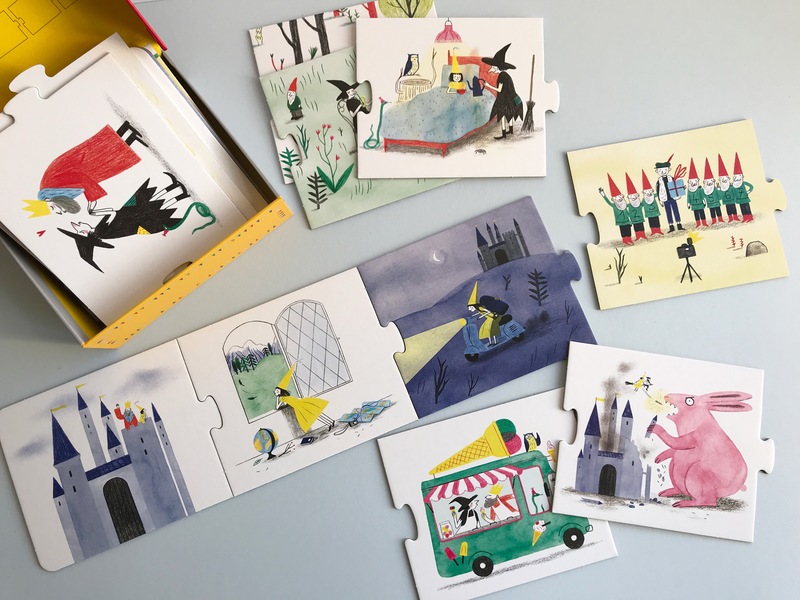 And since I am a member of the Books & Pieces Parent Panel, you can use my exclusive discount code bearandfox10 to get a 10% discount off any order. What’s just as much fun as reading a good story book? Making up your own stories! I have three different options for this to share with you. 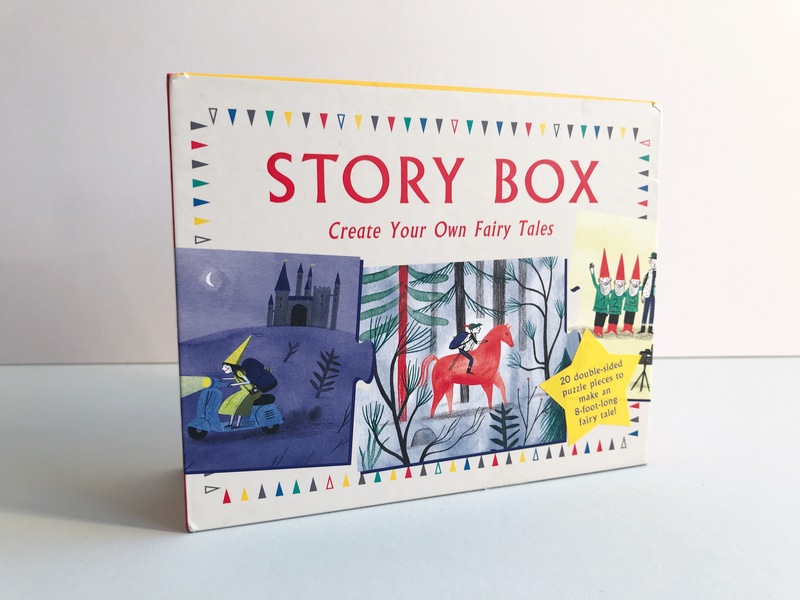 First up, is the Story Box. This is probably the most simple of the three, since it is entirely picture based and doesn’t not require any reading skills, so would be a great gift for slightly younger kids as they could use this on their own. It consists of 20 double-sided puzzle pieces, which can be put together in any order to create a new – 8 foot long! – fairy tale each time, with three alternate endings. Characters include dwarves, an elf, a witch, a big bad wolf, and a giant pink rabbit, and settings include a wood, a castle, and an ice cream van. The cards are nice and chunky, perfect for little hands, and the illustrations are gorgeous. Recommended for ages 3+. I’ve bought this as a Christmas present for Mr Fox, so the kids haven’t used it yet, but I am sure they are going to love it! Available from Amazon (affiliate link). Another, slightly more complex idea with a wider variety of options, are the Magical Story Jars, a new way to tell imaginary stories. We were kindly sent a free jar to review for this gift guide. 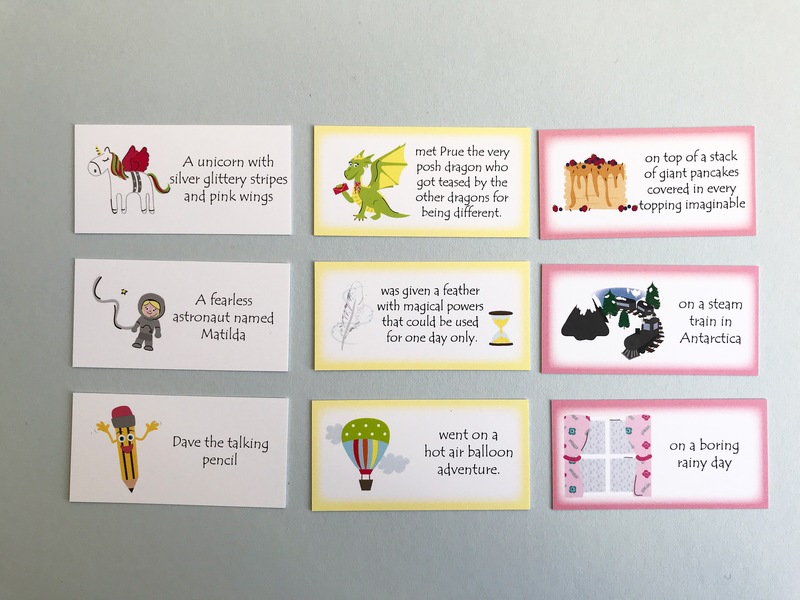 Each Magical Story Jar comes with three sets of colour coded cards – characters, settings and story outlines – some magic dust, and an instruction card. To begin your story adventure, sprinkle a tiny amount of magic dust in to the jar, then pick out some cards and use them as prompts to create your story. There is no right or wrong way to do this, but it is recommended to pick at least one card of each colour. There are also some blank cards included, so that you can add additional prompts e.g. people, pets or places from your child’s own life. 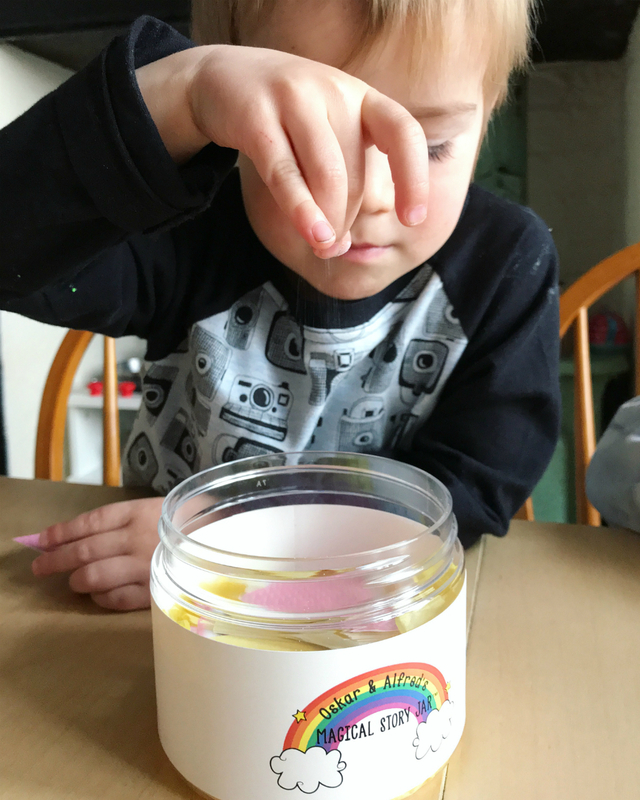 The Magical Story Jars are recommended for ages 3+ though they do involve reading, but the idea is that parents can use these with their children together, so the grown-ups can help out younger children who can’t read yet. But since each card also includes a lovely little illustration, alongside the text, my 3 year old has been able to get the gist of them even though he can’t read yet, and it doesn’t really matter that it isn’t always exactly what is written on the card. What I really liked about these jars, is that it isn’t just a matter of picking out some cards, joining them together and reading out the story. They really do just act as prompts, and the storylines are open ended, so it’s up to you and your children to continue the story and imagine what happens next. For example, one of the storylines is a feather with magical powers that can be used for one day only. What magic powers would you chose? What would you do for that one day? What would happen the next day when the powers go away again? Or there is Trixie the tooth fairy who has broken her wings and can’t collect the teeth from all the children. How would you help her out of this dilemma (this storyline really resonated with Oskar, who is in the midst of loosing his baby teeth). And some of the storylines also offer a chance to talk about moral dilemmas – e.g. what would you do if you found hidden treasure that didn’t belong to you, or dealing with emotions – e.g. the dragon who got teased by other dragons for being different. Again, something we have been through in our family, and that resonated with us. And, of course, all stories take a different turn each time, depending on what cards we pick out of the jar. 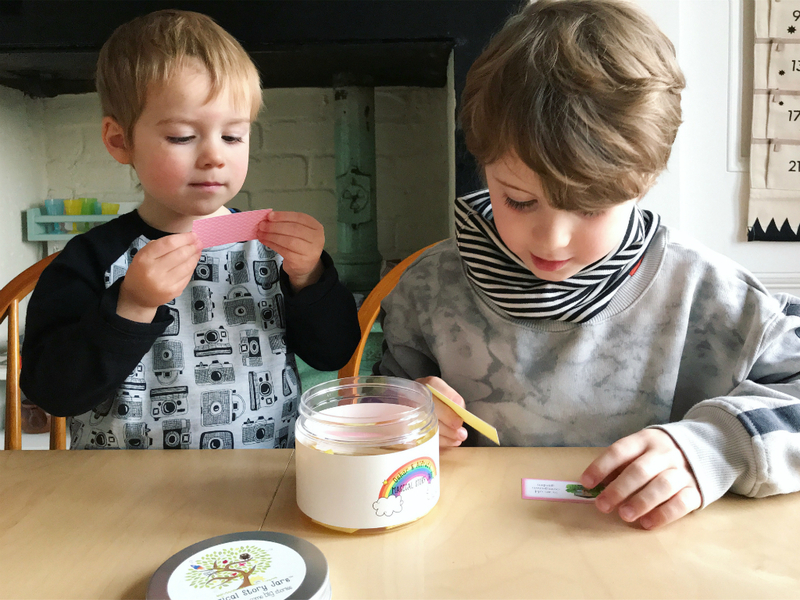 We’ve only been using the Magical Story Jar for a short while, before it was time for me to write up this guide, but the boys have really been enjoying it so far. Especially Oskar who, age 7, is becoming a master story teller and is using the prompts to let his imagination flow. And Mr Fox thought ‘Dave the talking pencil’ was hilarious, he is one of our favourite characters now. 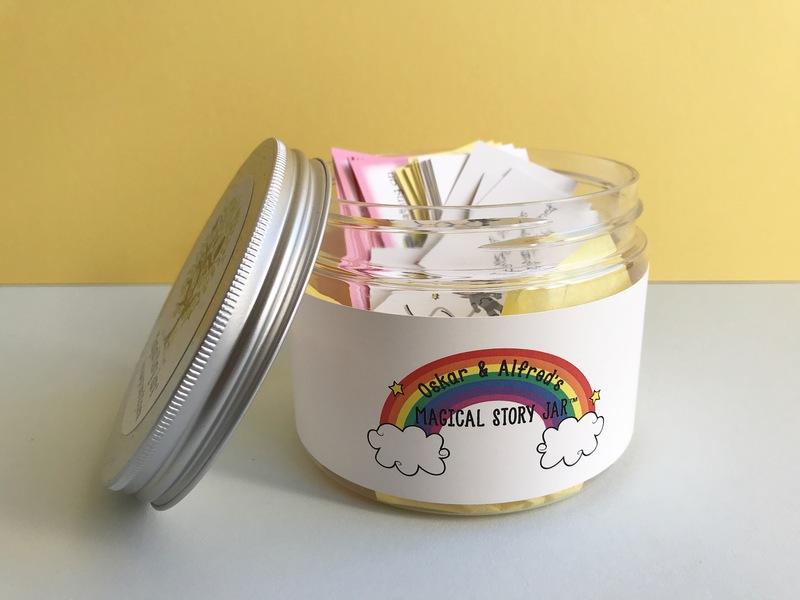 The jars come in two different versions – ‘Once Upon a Rainbow’ and ‘Bright Star’ – and given my children’s love of rainbows and unicorns, both of which feature in the Rainbow jar, we opted to receive one of those. You can also get them either with a generic label or with a personalised label, and the boys were thrilled to receive their very own personalised jar! The jars are available in the Magical Story Jars Etsy shop, from £16.95. And, finally, Walk-in-Book is a project I backed on Kickstarter a couple of years ago, and we have since bought a second set after gifting the first one because my boys were still too young for it at the time. The Walk-in-Book, which is called ‘Adventure to the Woods’, is described as “a book that’s been pulled apart, leaving just the important bits: the locations, the characters and the beginning”. 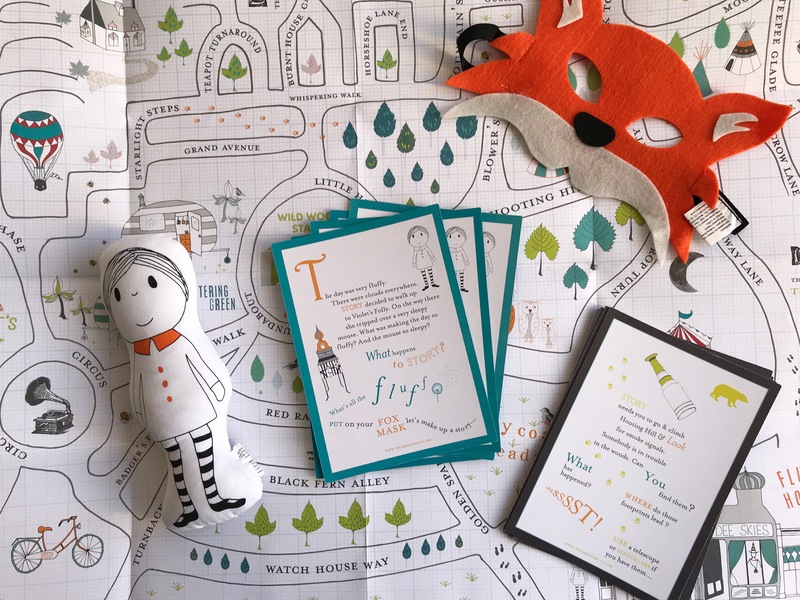 The set includes an A2 double-sided map, a soft character toy character, a felt fox mask, 5 story beginning cards, 5 story quest cards, and a set of instructions, all neatly stored in a miniature tote bag. To create a story, just spread out the mask, pick a ‘beginning’ card, and off you go. Use the character toy and mask as you please, or crack ahead without them. Throw in a quest card to mix things up, or just let your own imagination guide you. Recommended for ages 4+, but something the whole family can get involved in. The Walk-in-Book is available via http://www.wearestory.co.uk and retails at £25. One of the first things we did when we moved to our new place, was register with our local library. We are regular visitors there, and I don’t know about you, but we always end up losing our library books amongst all the other books and things in the boys’ room, then have to scramble around looking for them when it’s time to take them back. The perfect solution for this, is a library book bag! Of course, you could just use any old bag for this, but how much nicer would it be to have a special one. 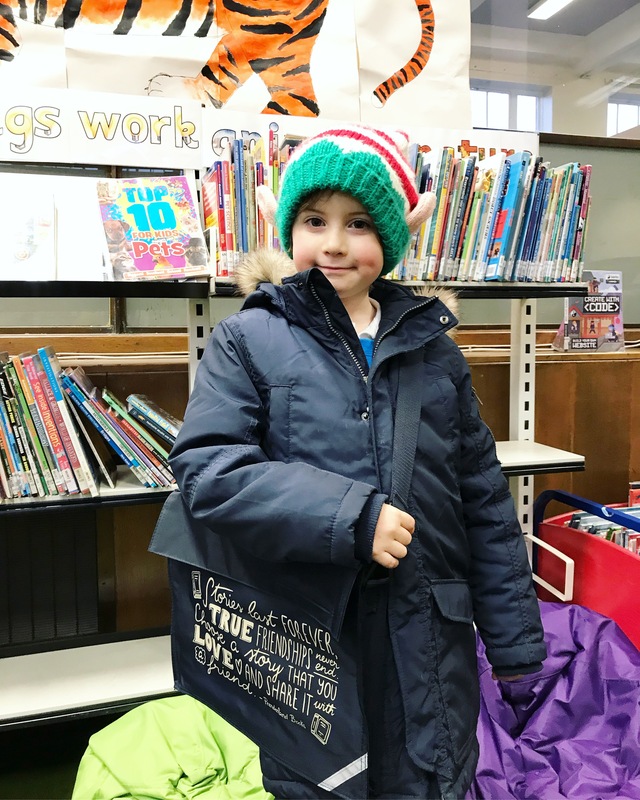 April from Prenderlandbooks kindly sent us one of her lovely children’s book bags for free, which we have taken for a couple of test runs to the library already. 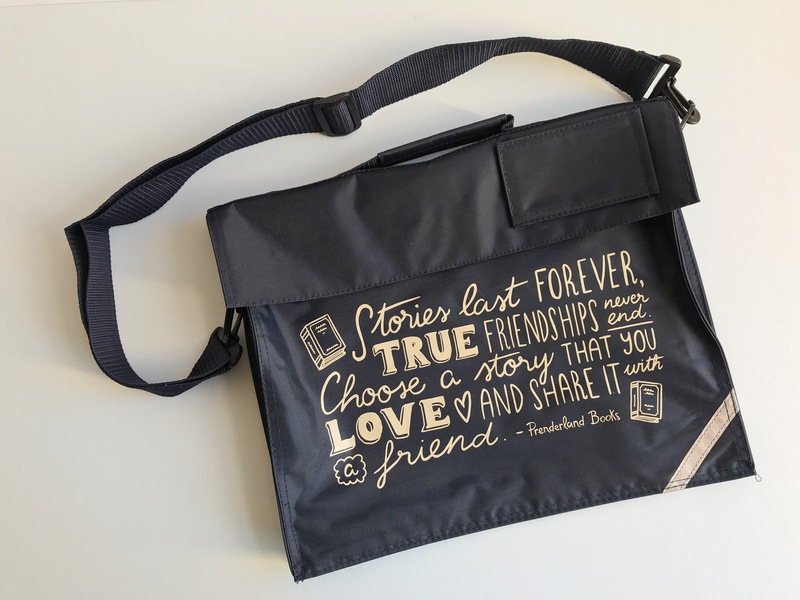 The quote on the front is perfect for a library bag, and it’s a nice size to fit a couple of books for each kid, but not too big for Oskar to carry himself. Now all our library books live in here – of course we take them out to read, but afterwards they go straight back in – and hopefully we won’t be losing any more of them! 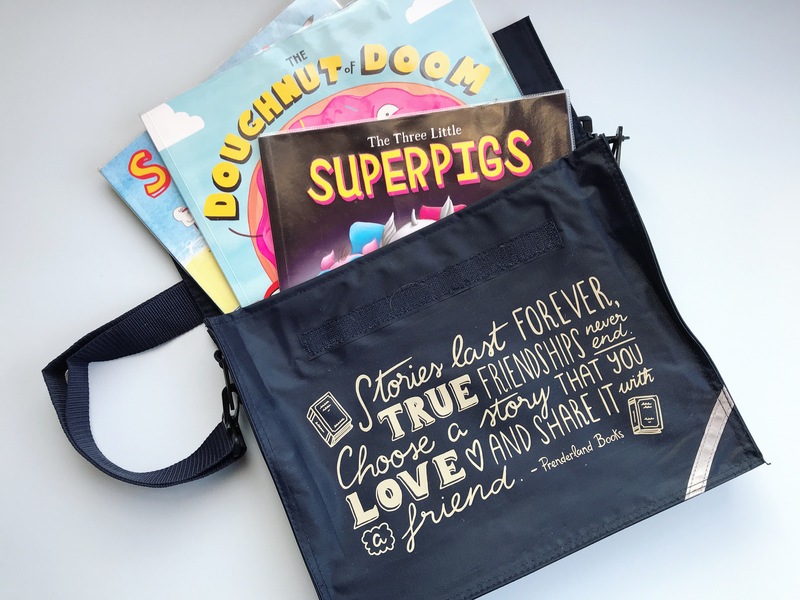 You can order your own bag from the Prenderlandbooks web shop. 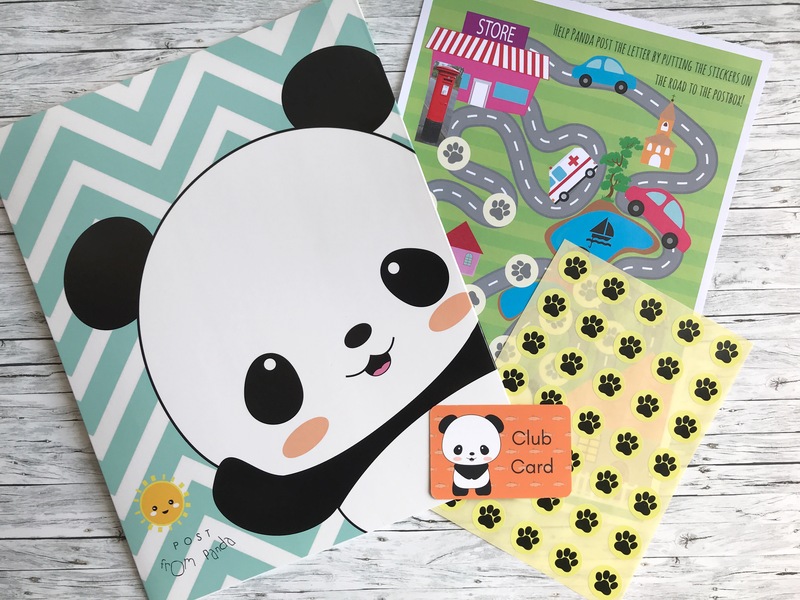 If you know a little book bug who loves receiving mail, then Panda Post might be just the thing for them. 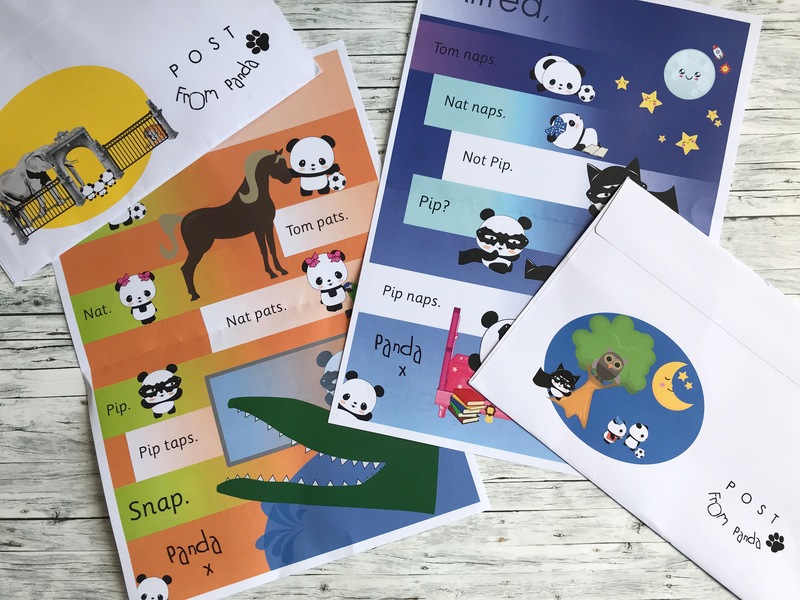 Panda Post is aimed at kids around age 4-5 (P1 in Scotland, Reception in England), who are just beginning to learn to read, and follows the National Phonics Curriculum. A letter gets posted to your child, via Royal Mail, every week, using the excitement of receiving real post to boost the enthusiasm for reading. We were kindly invited to test out Panda Post for free. First to arrive was a letter addressed to ‘Alfred’s Grown Up’, followed by two letters addressed directly to Alfred (whom you all know here on the blog as Mr Fox) himself. The most recent post we received, which came in a bigger envelope than the others, contained a folder to save our letters in, an activity sheet, some stickers, and a club card. 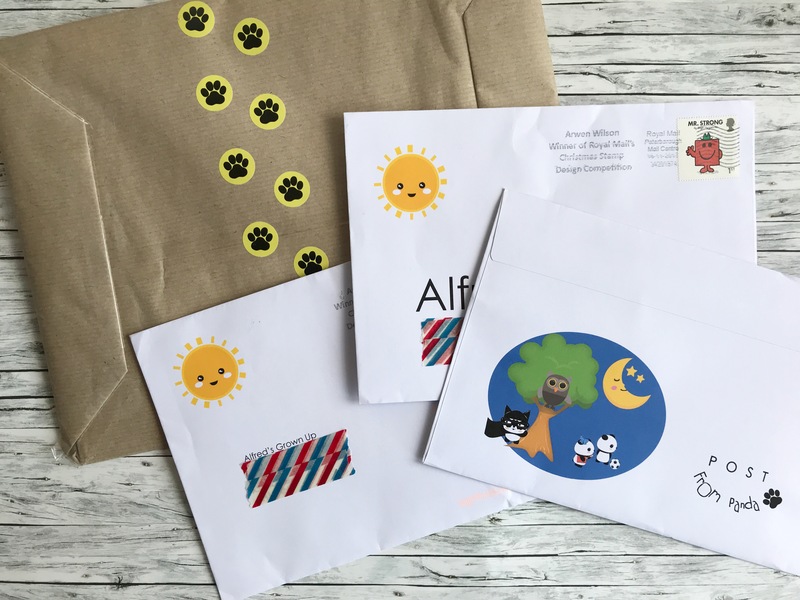 At age 3, Alfred is still a little young to read, but he can already recognise his name, so he got really excited when the postman popped the letters through the letter box and he spotted that they were for him. The letters themselves contained a few short sentences using early phonics, with the most adorable, cute illustrations. These are also mirrored on the envelope, so e.g. the first letter had an illustration of a zoo on the envelope, and the sentences and illustrations inside were all about animals, whilst the second letter had a night time scene with an owl and a moon on the envelope, and the sentences and illustrations inside were all about napping. I had to help Alfred read the letters, as his name is the only word he can read so far, but he loved that they were ‘his’ letters – and he absolutely adores pandas. I think once he is a little bit older, I may consider signing him up for a full subscription. 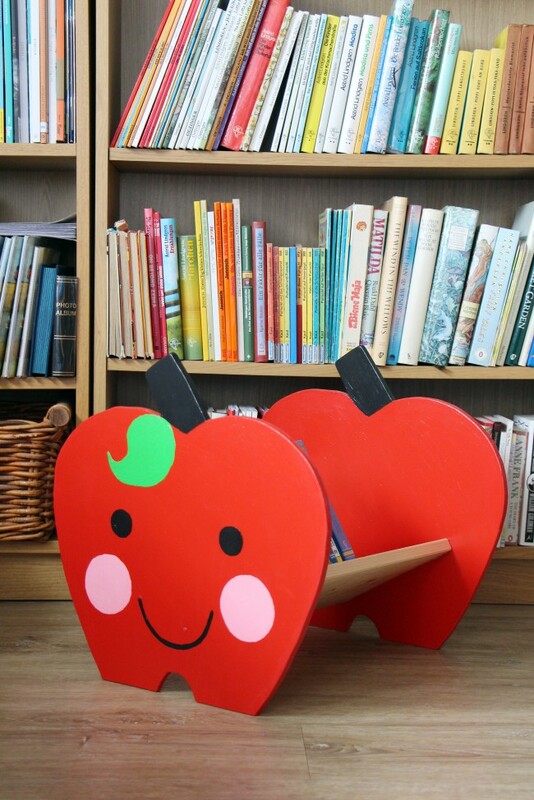 The reading level of the letters follows the school year, so it starts in Autumn with the first few letters children will learn at school, then builds up to include more letters and sounds as the year progresses. If you subscribe further along, you won’t start at the beginning of the letters but will join in at whatever point during the school year you subscribe, which means a child who is already half way through their first year at school when subscribing, would get letters corresponding to the reading level at that point in the curriculum. At the moment, Panda Post is only available for the first year of school (P1 in Scotland, Reception in England), but they are looking to expand it to following years. A subscription costs £16.99 per month, and there is no contract so you can cancel at any time. Disclaimer: This post contains items which were sent to us for free, for review and inclusion in this guide, as indicated in the relevant sections. However, all images, words and opinions are our own. Ah, goodness. What gorgeous ideas for kids who love all things books! I really miss my boys being little and reading to them (it’s pretty much all Horrid Henry now for my youngest and although he still likes me to read from time to time, it’s not the same). 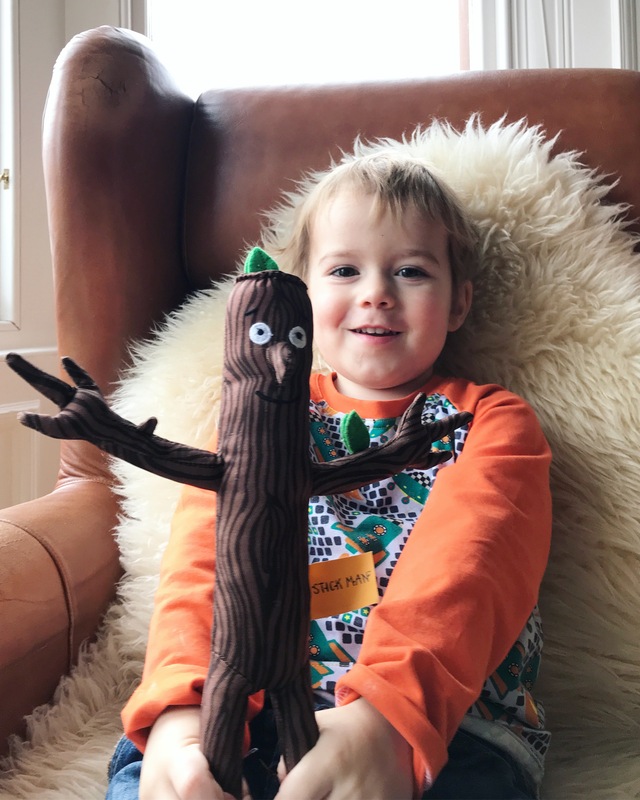 I haven’t heart of the Stick Man but this would definitely have been on our list when the kids were small – love the Gruffalo! This is so helpful, my little one loves books and his only 16 months old. 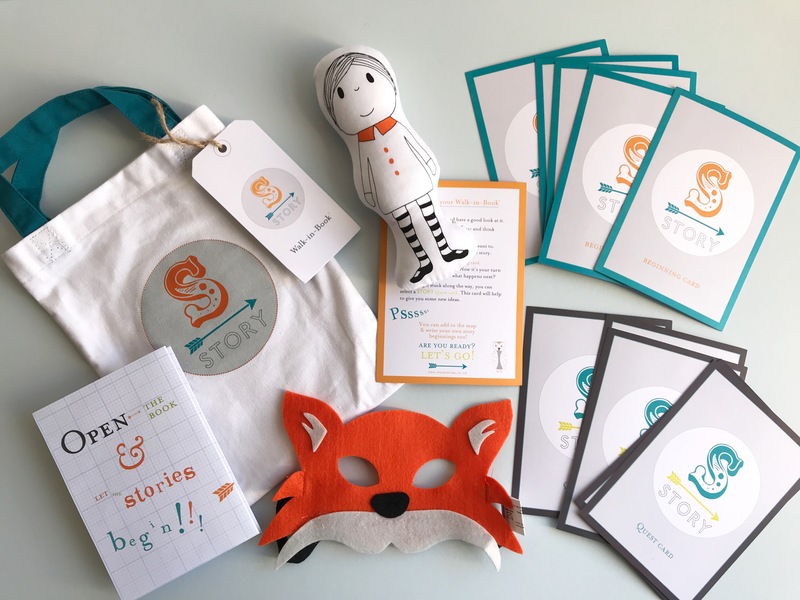 I love the Story Box jigsaw! I love the fact you can get your child their own Stick Man…just think of the adventures they could go on! I love the idea of the magical story jars, I think I will keep my eyes peeled for this. Great stocking filler.